Let's talk about Stanley Home Products. The height of women selling from their homes, really seem to start in the 1950's. There were many options of style of products to sell... and not just Tupperware! This is about the Stanley Home Product line... that was based in cleaning products for the OCD housewife. From liquid cleaners to all kinds of brushes. Brushes for all occasions. And if you are active estate sales/flea market shopper. You will stumble across those vintage brushes without trying. Especially those old shoe shine brushes. As with all these at home sales, there were Hostess Gifts. It is the Hostess Gifts that always become the ones you want to find. 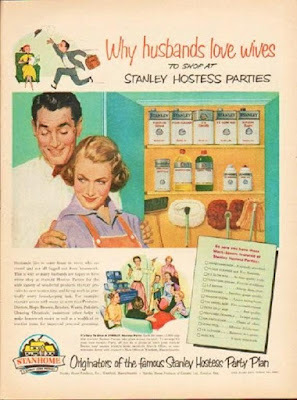 Stanley Home Products had all kinds of things for the hostess to collect. They had a nice line of kitchen ware items. That I can not find a catalog to show what the line had to offer. Believe me... I have been stalking eBay for months looking for this stuff. There was a lot for a lady to buy for her home. But first she has to hustle and sell some product! Get that cash flow going. Now there was more to the Stanley Home Product line... than the home cleaners and brushes. They also had the Lady Catherine Line. Items for your bath... makeup for your face... and body brushes. I actually recall my Granny having this exact brush in her bathroom. Matter of fact, I am thinking she had a couple of them still in the boxes, thirty years after she purchased them. They really did not wear out. Or how about a Lady Catherine powder mitt? How fancy! Of course there were the small gifts, for attending a party. Such as these sweet needle packets. I went looking through my kitchen to see what Stanley Hostess items/kitchen wares I had in the drawers. The pink cookie cutters are from Stanley... and the pink cake knife with the slots. (Ignore the other stuff... I had this picture handy.) They both came in numerous colors. 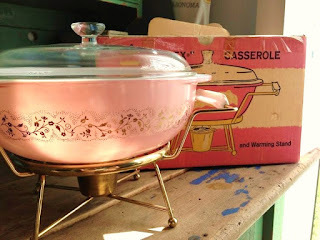 I am just the weirdo who collects the vintage pink ones. Now for me the ultimate thing that was ever offer from Stanley... is the canister sets. They came in many colors too! White, yellow, pink.... and turquoise! 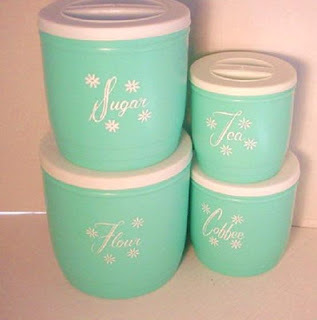 The best thing about these canisters, they were made out of a plastic that had a little give to it. It was not some cheap hard plastic, that would shatter when dropped. These have a little softness to the plastic. So they held up beautifully over the decades. Recently, I saw that this collector @ They call this America... had herself a great collection of the canisters in her kitchen! Stanley would often do a cross promotion, with other name brand product lines. Such as Libbey Glassware. The above is their Pink Duchess juice set. It was offer exclusively through Stan Home Products. Yet, I suspect it is that Pyrex Casserole... Pink Duchess... that would be the most sought after piece of kitchen ware that they promoted. I had pinned this image back in 2013 from eBay. And it sold for 189.00 and I bet it went to a lovely home too! Hey, thanks for the shout out! I had no idea these were Stanley Home products, so you've solved a mystery for me. I'd love to know more about where you learned that from. Very cool! Like I said on that post, I owned a partial set of avocado green with white writing, but they were in sad shape so I ended up donating them. Online, I've seen what appears to be a bright yellow set with gold lettering (my yellow set is pale-r yellow with silver), and I believe there's a turquoise set with black writing. Someone left a comment on one of my posts that they'd seen a red set on instagram before. The only other Stanley Home products item I own is a yellow plastic refrigerator set I'm not sure I ever posted. It's the same size approximately as a glass Pyrex set. I've always wanted to find cannisters like that. Love the cookie cutters! If you get a chance, come link up with the other vintage lovers at Vintage Bliss Tuesdays! I've never seen these cookie cutters in pink before but always in red.